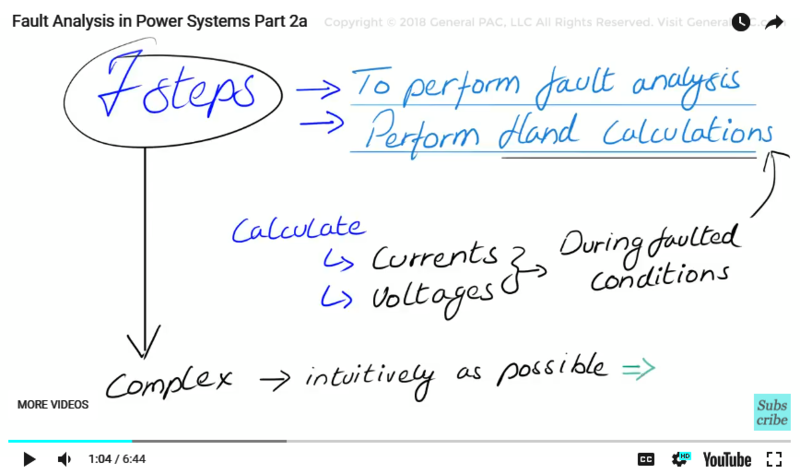 Fault analysis in power systems part 2a, in this video we will outline 7 steps required in order to perform a fault analysis in a power system for a given fault and perform hand calculations, meaning calculate the current and voltage quantities during faulted conditions by hand now these seven steps are quite complex but we have tried our best to minimize the complexity and to explain them as intuitively as possible. Now in part 2a we are going to go over the high-level overview of the seven steps in order for us to get a better understanding holistically, in the remaining parts we will go through each step and view them in much greater detail so that we can get a really good intuitive understanding of the process involved. 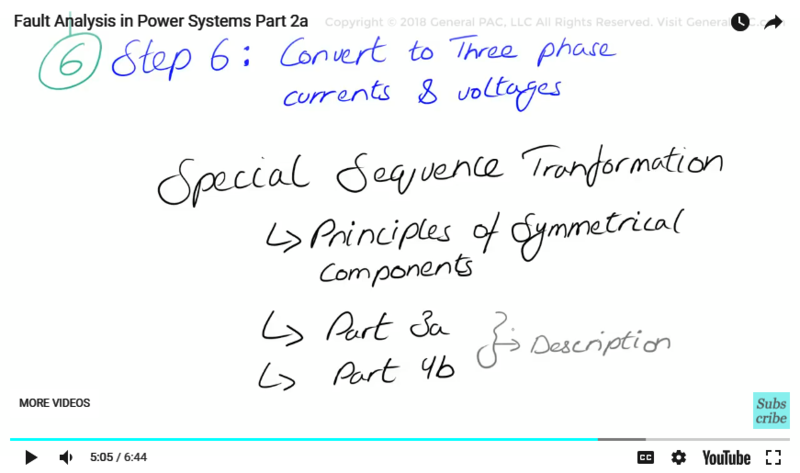 So in step 1, First step is to actually convert the system into per unit values, now the reason why we convert it into per unit values is because we want to eliminate the voltage levels that occur in power systems due to voltage transformation, so if you have a low voltage to high voltage transformer, or a high voltage to low voltage power transformer, it adds an incredible amount of complexity when calculating fault currents so in order to remove that entirely, what we will do is convert the system into per unit value and bring the entire system into a single per unit level and an example of this, really brief example is covered in part 2b. Now the second step, step number 2, is to identify the type of fault that is being analyzed. There are symmetrical faults that do not give rise to zero sequence or negative sequence components because they are perfectly balanced, so they only have positive sequence values. 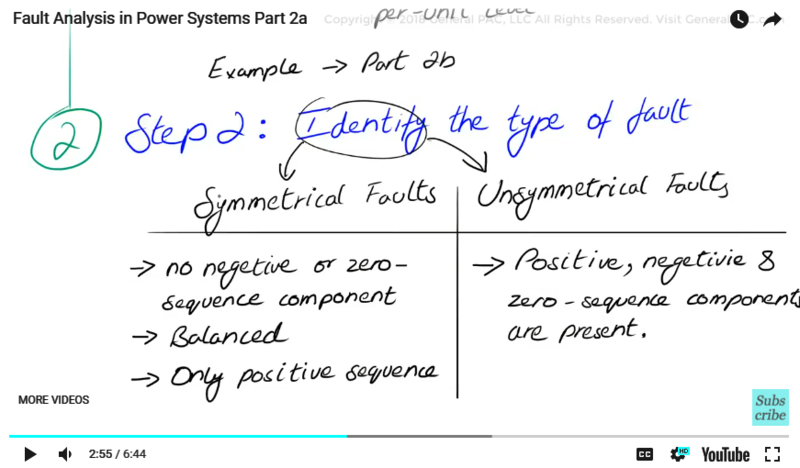 And on the other hand there are unsymmetrical faults that mandate the calculation of positive negative and zero sequence components separately and because of these different types of faults that occur in power systems and their different characteristics we really have to identify the type of fault that is being analyzed because the remaining steps are dependent on it. Now in step number 3, the third step we draw the sequence networks for the un-faulted systems now un-faulted system means that we are drawing the individual sequence network diagrams for the system and in later steps we will connect the diagrams, you know, in a very particular way so the un-faulted systems is simply the individual sequence network diagrams. Now step number 4, the fourth step we take the un-faulted sequence networks and we modify and interconnect them according to the type of fault to make a faulted sequence network diagram. 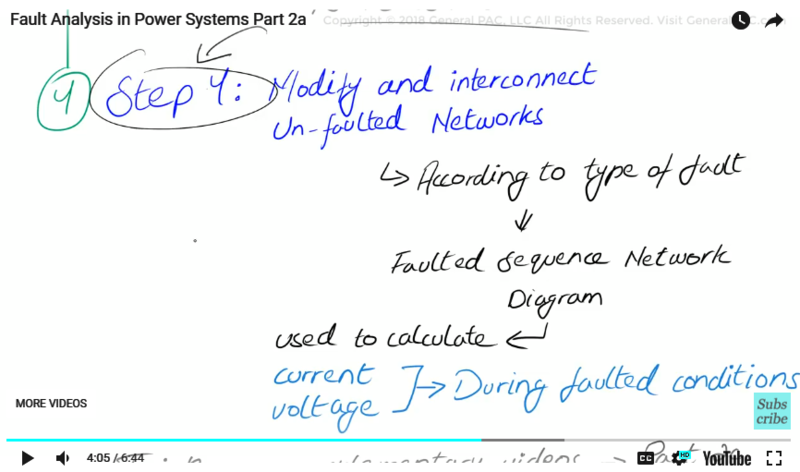 And the faulted sequence network diagram will then be used to actually calculate by hand the current and voltage quantities during a faulted condition, now this is a very tricky bit, so in order to get a better understanding of this we create a supplementary videos part 2c and part 2d in order to get a better understanding of step 4. Now in step number 5, we will hand calculate the sequence currents and voltage quantities during a faulted condition so will calculate the positive sequence current the negative sequence current and the zero sequence current depending on the type of fault that is involved and keep in mind that in step 5, these current and voltage quantities are per unit values. Now in step 7, the seventh step, this step can be actually skipped and we are calculating the fault that occurs on the low voltage side of the transformer, all of our current and voltage calculated quantities are based of the low voltage side. 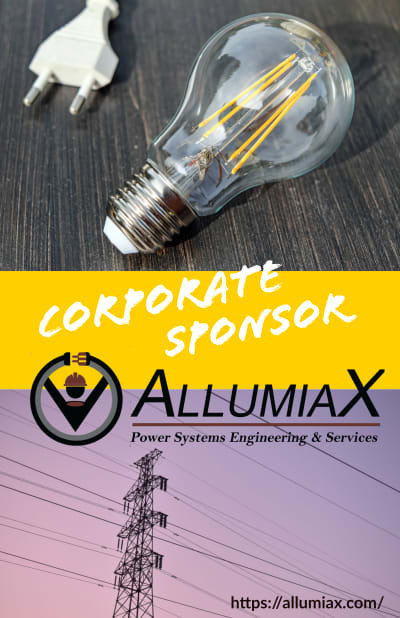 Now if we wanted to analyze what would happen on the high voltage side of the transformer for a fault that occurs on the low voltage side, this requires a very special step, there are special things that we need to adjust in our calculation in order to make that assessment. And this step is supplemented by part 2e and 4a videos but you may skip this part if it is something that is above your head or comeback to it later. Now all these seven steps are quite complex and it is necessary to review them one by one and go through them in much more detail and that would be the basis of the remaining parts of this series so be sure to watch part 2b and part 2c of this video series. 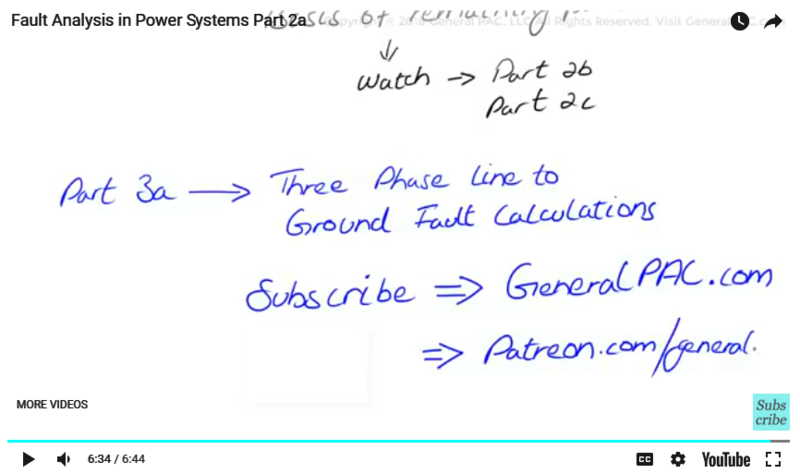 In part 3a we will be going over the three phase line to ground fault calculations. Now if this video was useful and valuable to you please be sure to subscribe at generalpac.com and donate through patreon, patreon.com/generalpac to become our patron and get valuable insights to our video tutorials and participate in webinars thank you.